A clue from the distant past! colored number sticks, a photo by otherthings on Flickr. 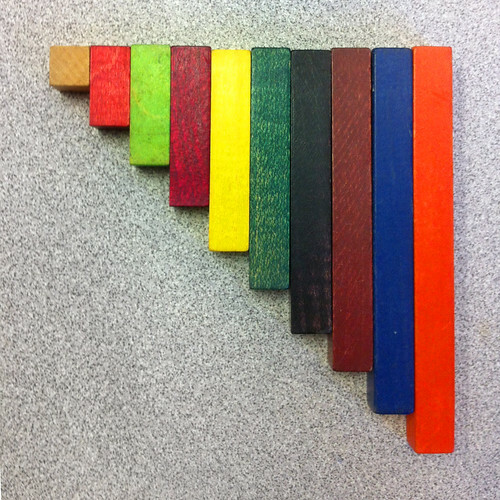 While looking at a possible kindergarten for our 4-year-old, I stumbled on a bin full of these colored wooden blocks in one of the classrooms. I remember these blocks from my classroom in 2nd grade. The shortest stick is a cube, and the longest is ten cubes. You can use them to teach arithmetic, by putting them together end to end and seeing how they line up, arranging them into rectangles, and so on. But what caught my eye was something very different: according to my synesthesia, the first three blocks are all exactly the right colors. In particular, the unit block, being unpainted wood, perfectly captures the tendency of the number 1 to hover between white and yellow in my mind. I have vivid memories of playing with these blocks, assembling them into shapes, in that 2nd grade classroom. Could this be the origin of my synesthetic map? It feels too right to be a total coincidence. And yet, none of the colors from 4 through 10 match my mappings at all. Apparently the blocks are called Cuisenaire Rods (or rechenstäbchen) and their colors have not changed substantially since the 1950’s. This means that thousands of synesthetic children may be exposed to these blocks during their formative years. I wonder if anyone else had their colors influenced in this way?